In the afternoon of February 4, women surrounded the pantu and children at an intersection, driving off evil spirits at Uenonobaru in Miyako-jima. 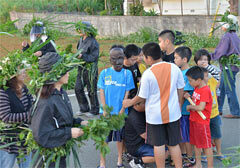 On February 4, a traditional ritual known as satiparo was held at Uenonobaru in Miyako-jima. With a child wearing a carved wooden mask and performing as a visiting deity called pantu out in front, 14 women wrapped in vines walked around the community and drove away evil spirits. The satiparo ritual was designated as a significant intangible folk cultural asset in 1993. The event is held annually on the last day of the ox in December of the old calendar. Adult males do not take part, but females and children do. Women and children gathered at an old well and departed at approximately 6:00pm. Calling out “hoi, hoi,” to the sound of conch shell trumpets and drums, the women wrapped in palm leaves and vines beat bundles of yabunikkei together, and walked through the community with the child performing as the pantu out in front. At intersections, they surrounded children and exorcised evil from them.